I never claim to be an interior decorator. However, I love having our household items organized. While I could blow the budget at The Container Store, I have found a free alternative – shoe boxes. I usually save our empty shoe boxes and have found several ways to use them as organizing tools. 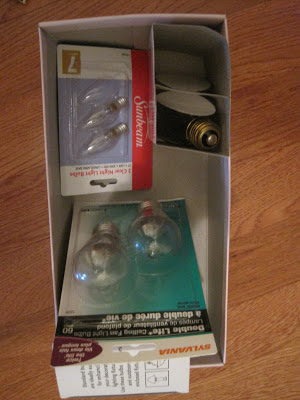 In the top of this closet, a small shoebox holds extra light bulbs while a large one holds appliance instruction manuals and warranty information. 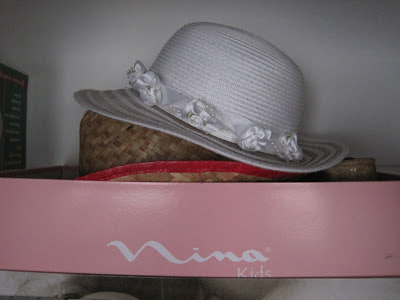 In a boots shoebox in the top of our daughters’ closet, hats are stacked. 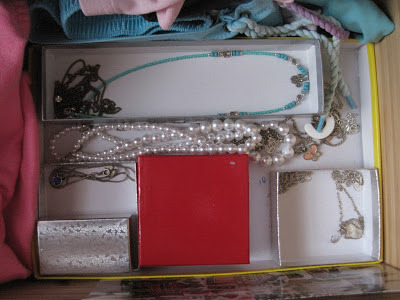 My older daughter used a shoe box lid along with several empty jewelry boxes to organize some of her jewelry in a drawer. 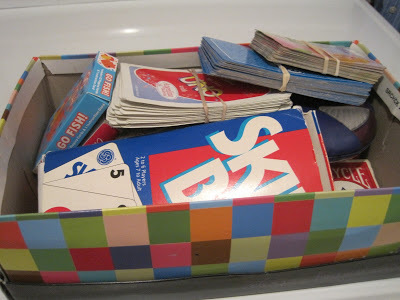 Card games are corralled in a box in a hallway closet. 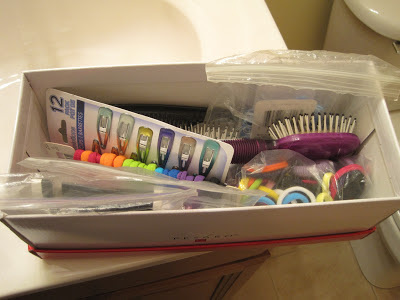 Hair brushes and accessories live in a box in the cabinet underneath the bathroom sink. Is there an inexpensive tool you’ve found useful for organizing items in your home? I stock up on the photo boxes when they go on sale at Michaels, and I love the clear rubbermaid containers with lids from the dollar store! Yes – those clear containers from the Dollar Store can be used in so many ways! I hadn't thought about using shoeboxes like that. What a great idea! Usually, I buy the cheap plastic containers that are the size of shoeboxes and are about $1 each.